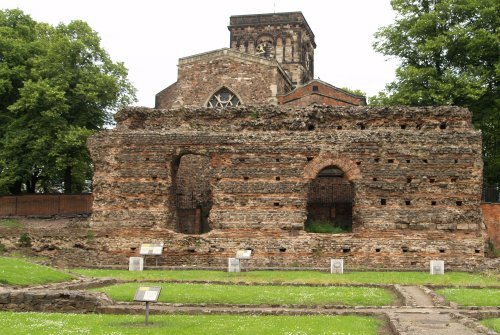 The Roman name for Leicester was Ratae Coritanorum (in Saxon times Leicester is known as Legorensis civitas in the kingdom of Mercia). 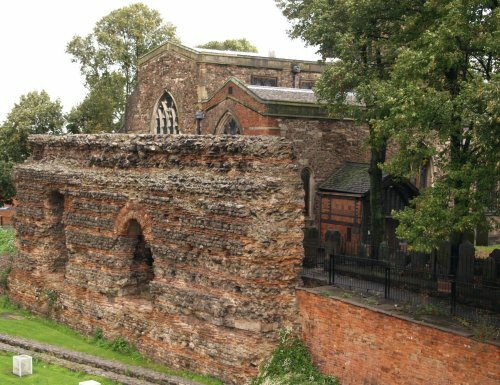 The Jewry Wall archaeological site, part of the foundations-remains of the Roman public baths built between AD 145 and AD 170, and one of the best preserved Roman ruins in Leicestershire. 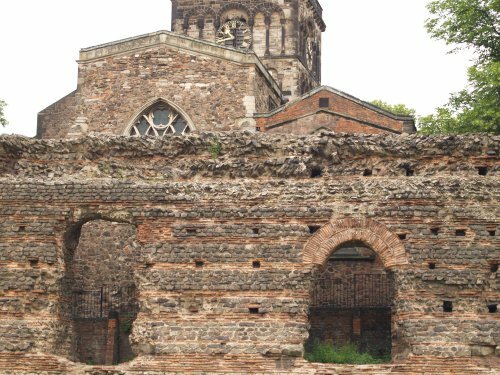 The church of St Nicholas is in the background, and not surprisingly, it reuses some of the Roman masonry in its construction e.g. 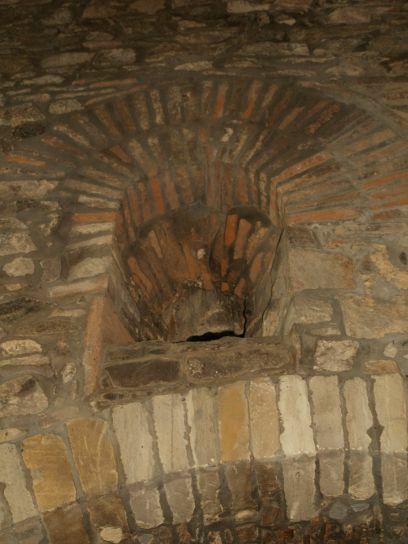 you can see thin red Roman bricks in parts of the walls and the Saxon windows (see further on down the page). 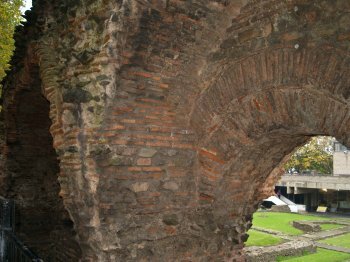 Close up of the Roman Baths Jewry Wall from the entrance to the Jewry Wall museum, which is well worth a visit for any tourist-visitor passing through, or staying in Leicester. 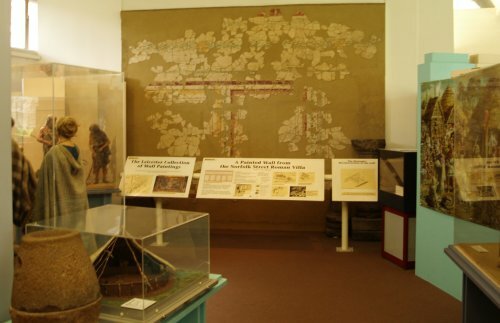 The Jewry Wall Museum, Leicester. 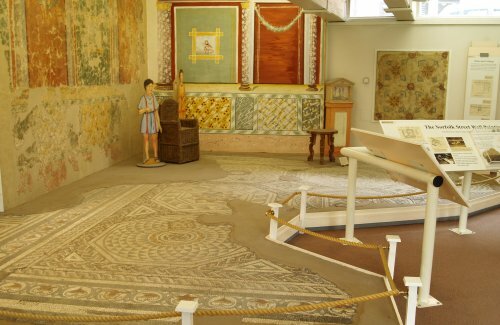 On display are the remains of a painted wall from the Norfolk Street Roman villa archaeological site and also a mosaic pavement and other coloured displays illustrating life in the Roman Empire. The remains of a Roman mosaic floor in the Jewry Wall Museum. 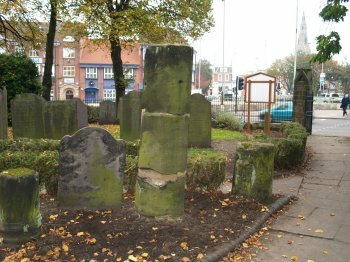 Sections of the Jewry Walls of the Roman Baths remains in Leicester and some fragments of Roman columns in St Nicholas churchyard. 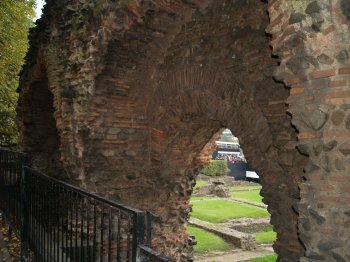 The typical thin red bricks used throughout the Roman Empire are clearly visible as well as quite rough masonry and the foundations of the Roman Baths are seen through the arches below the Jewry Walls. 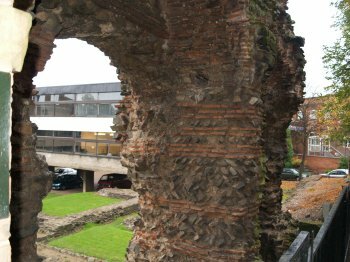 The Roman Jewry Wall and St Nicholas Church behind. 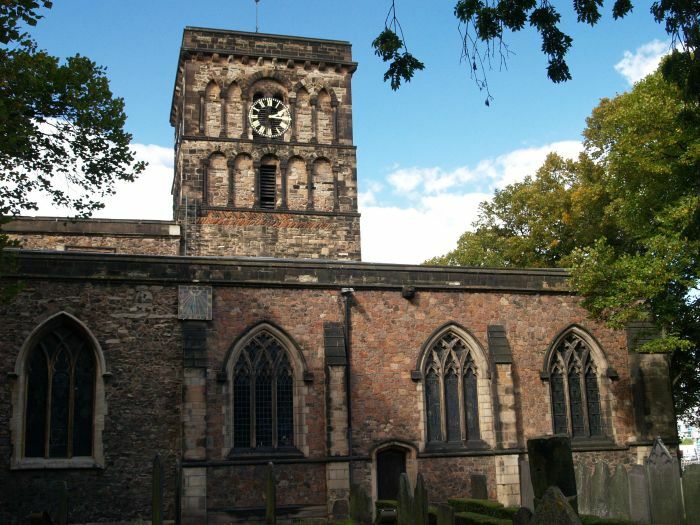 St Nicholas Church, Leicester: This lovely old church has been a place of worship for over 1200 years and the first church was possibly founded on the site as early as ~AD 500. 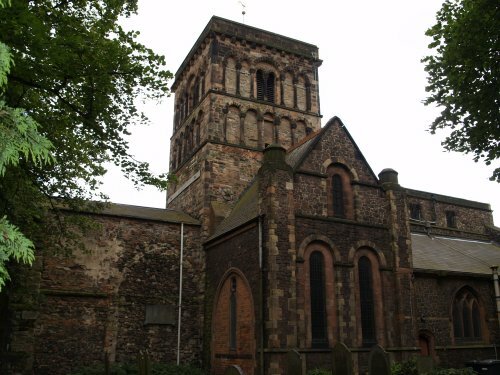 St Nicholas Church, Leicester: The south wall of St. Nicholas Saxon-medieval Church which still retains some of its Saxon origins in the nave and north walls in particular. The Normans rebuilt parts of the Saxon church and added to the structure. 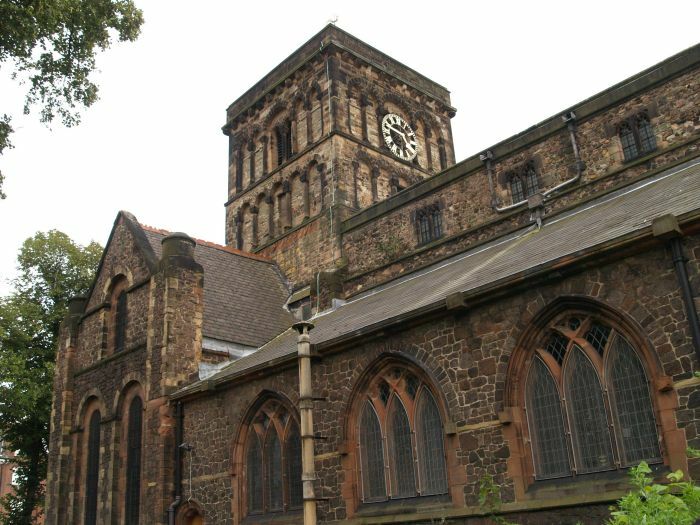 St Nicholas Church, Leicester: Sometime after the Norman Conquest of 1066 the present church was remodelled in terms of the doors, tower, arches, original north aisle and early English arcades of the late 12th/early13th century. 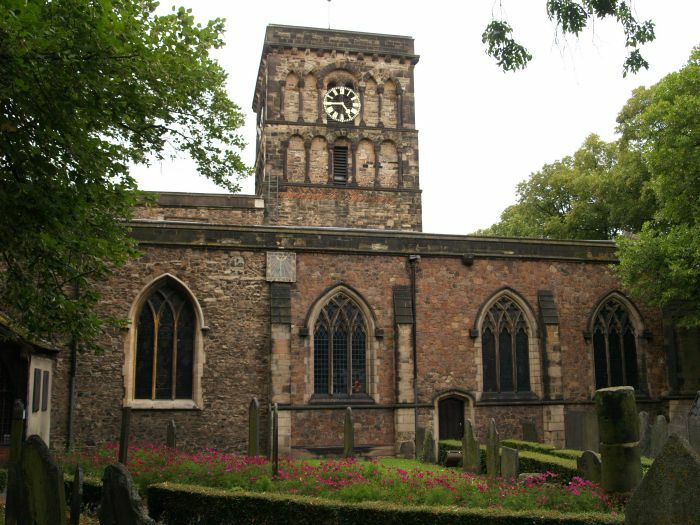 St Nicholas Church, Leicester: The church was dedicated to St Nicholas in 1220. 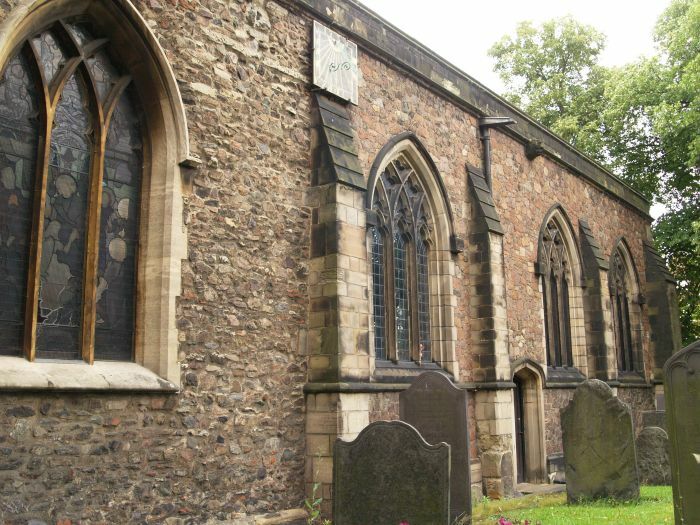 St Nicholas Church, Leicester: The protruding north wall retains some Saxon stonework in parts of the north facing walls and windows. 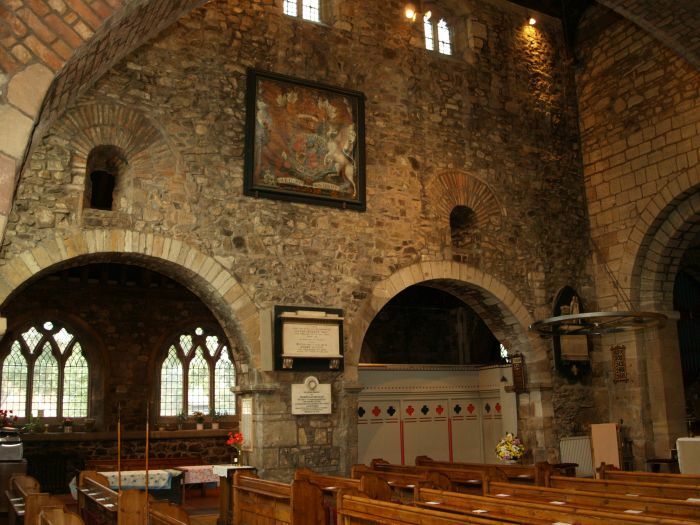 In 1485 a nave roof was installed over clerestory and a porch erected around the Norman door. 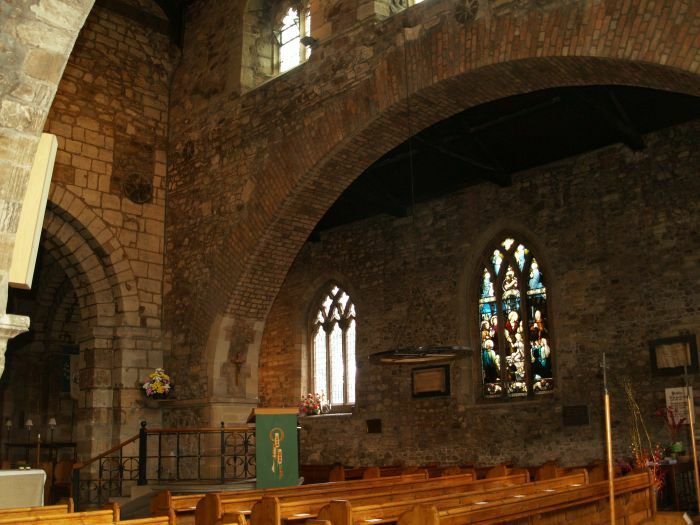 In 1645 the north aisle was demolished but rebuilt in 1856 along with the installation of the organ. St Nicholas Church, Leicester: Details of the varied style of arches on the tower of St Nicholas Church. There is a mixture of styles. 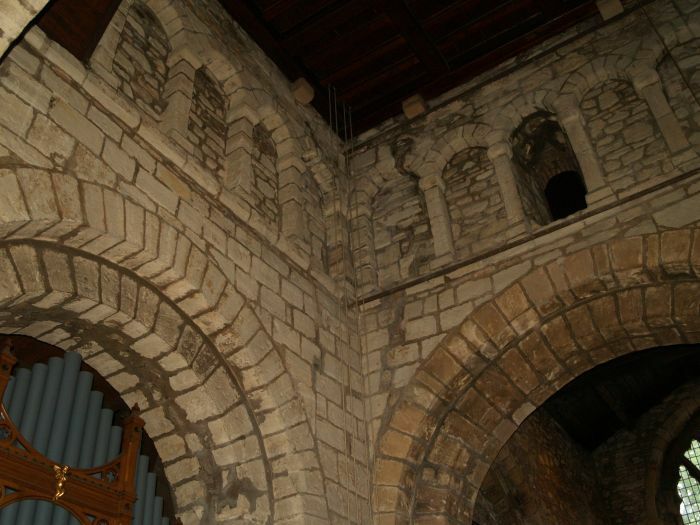 The lower curved arches are Romanesque in style and the pointed arches are from the later Norman period. 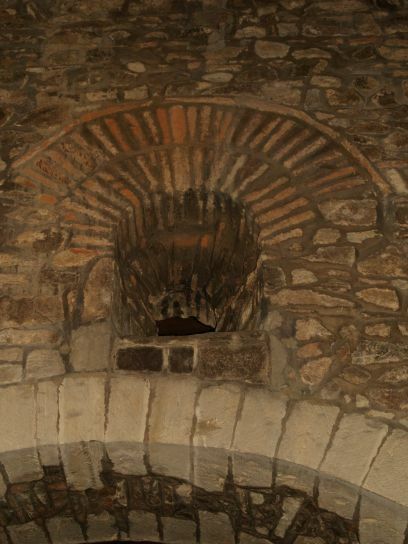 There are two courses of angled 'recycled' Roman bricks below the Romanesque arches in the tower. 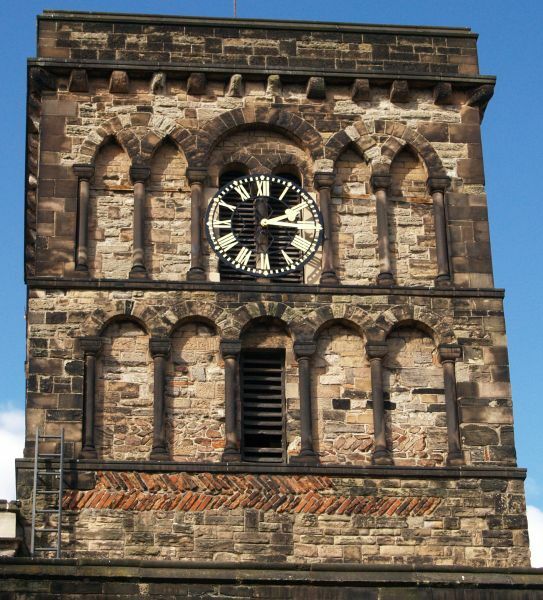 In 1300 a broach tower spire was erected but this was removed in 1803. 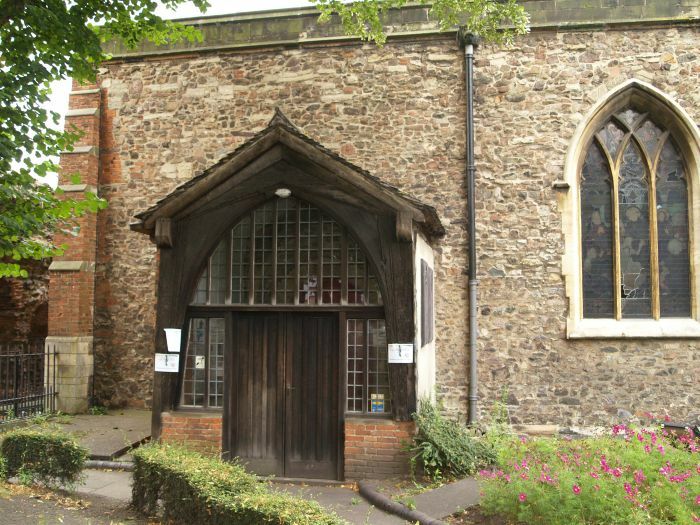 St Nicholas Church, Leicester: The Tudor porch built in the 15th century. 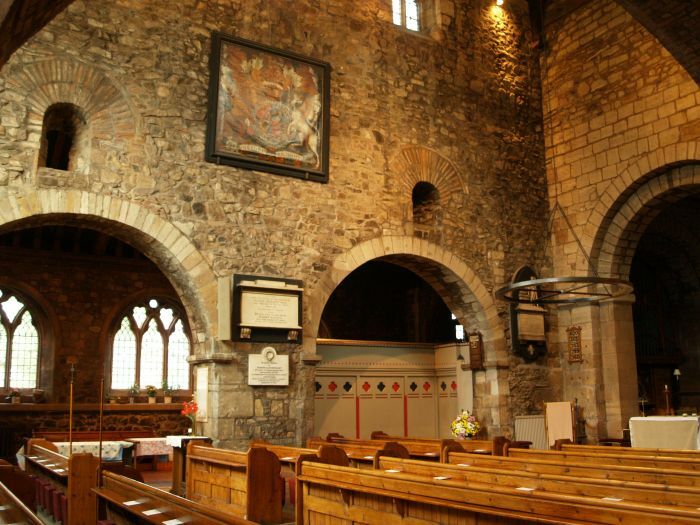 St Nicholas Church, Leicester: Above the round Romanesque arches and below the upper clerestory windows are two Anglo-Saxon windows made of Roman bricks - several examples in the church of re-used Roman masonry. St Nicholas Church, Leicester: The huge brick arch separating the south aisle from the nave was built in 1825. 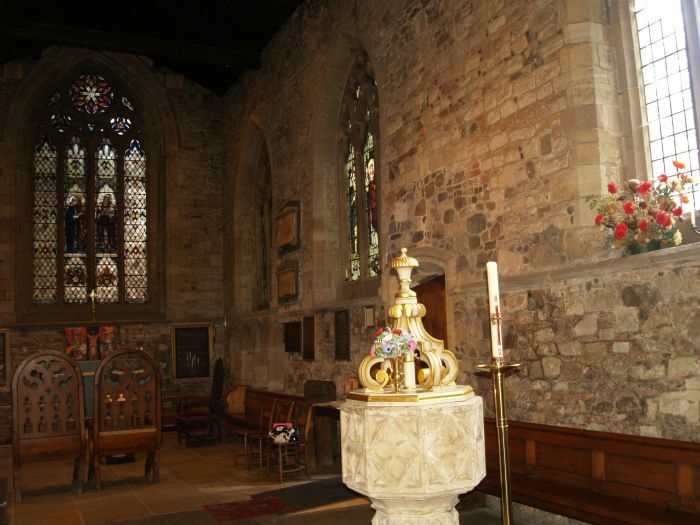 The clerestory windows, to let in more light, are at the top left of the image. St Nicholas Church, Leicester: Looking across the nave to the south aisle and one of the stained glass windows. 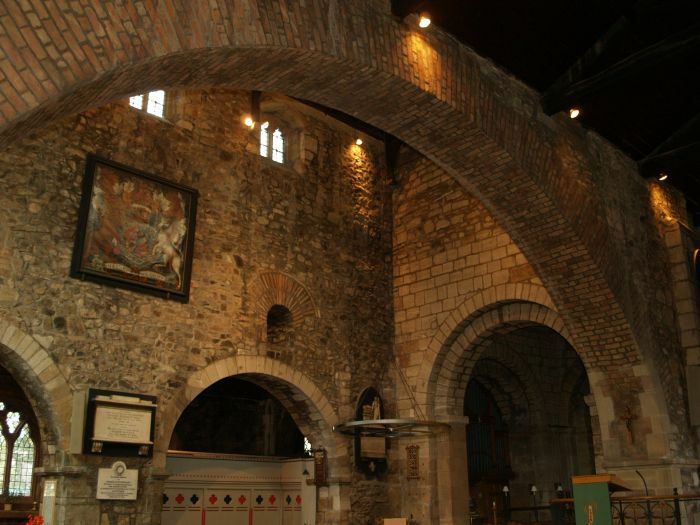 St Nicholas Church, Leicester: Under the Norman tower of 1180 with its 'blind' arcades - again round arches of the early Norman Romanesque style. 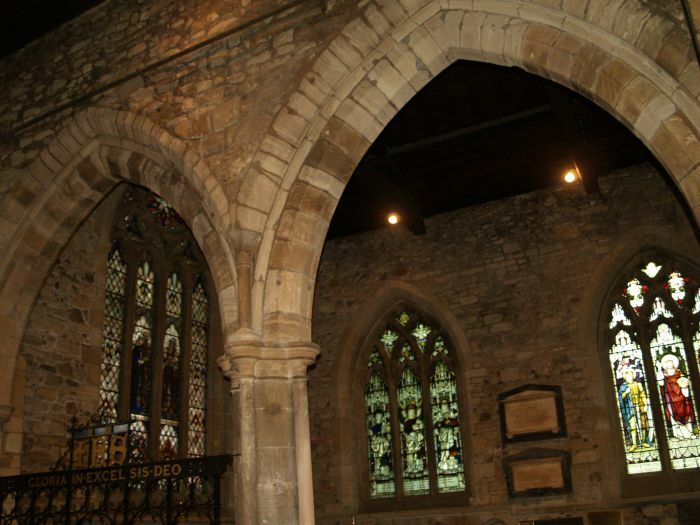 St Nicholas Church, Leicester: The 12th/13th century arcades separating the nave from the south chapel which is an eastward continuation of the south aisle. St Nicholas Church, Leicester: The south chapel, looking towards the Atkin's memorial window of 1929 and in the foreground the 15th century font..
St Nicholas Church, Leicester: Left: The decorated 15th century font from St Michael's Church, Stamford. 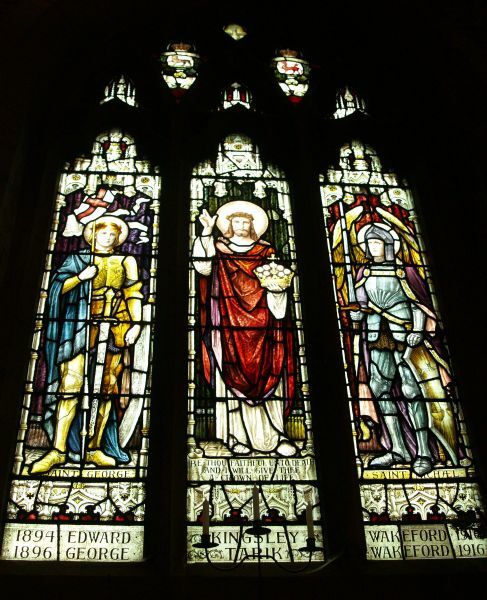 Right: The Wakeford family stained glass window.